This Sunday I heard Sasidhar Reddy, Vice-Chairman of our National Disaster Management Authority(NDMA) asking each state to create its own 'Disaster Response Force', just like the center's National Disaster Response Force (NDRF). In fact, Reddy said that the response force should be capable enough to manage not just natural calamities, but also the consequences of a chemical and biological attack. A year ago, when tsunami hit Japan, I remember watching on TV the visuals of rising wall of sea water, floating cars, submerging building blocks etc and getting awestruck by the way people over there kept their cool, without any visible sign of panic anywhere. I remember sharing this thought on Facebook and learning that almost everyone of my friends also wondered about it. We knew the answer of course: the Japanese didn't panic, because they had a disaster management system that they could totally rely on. This is why I found Reddy's statement quite interesting. Of course, it was also too ambitious (chemical and biological disaster preparedness, when we don't even have readiness to take care of a flash flood??? ), nevertheless worthy to be taken seriously simply because to ignore it would mean being stupid. Take Jammu and Kashmir for example. 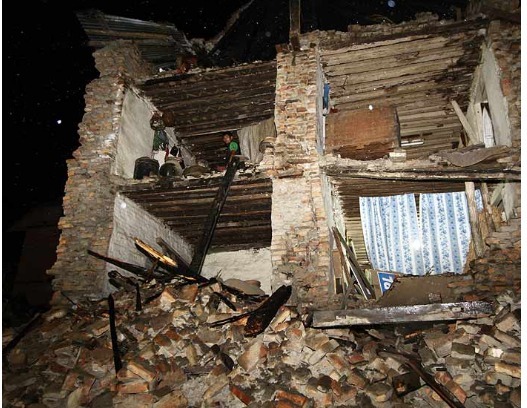 The state, located in the seismic zone five and surrounded by tectonically active Himalayas, is described as highly vulnerable to natural disasters including earthquakes. Yet, the state government is yet to finalize a Disaster Management Policy, let alone form a response force. Every month we hear mild tremors occurring here and there in the state. God forbid, but what if a not- so-mild tremor hits? Will the personal charisma of Omar Abdullah be able to save the people there? Similarly, Maharashtra, the state that had one of the world's worst earthquakes in 1993 (known as Latur earthquake) that claimed 7928 lives, is yet to have a state disaster management authority! The situation , however, is not very impressive even in those states that have already adopted a disaster management policy, but have, in reality, little preparedness to fight a disaster. For example, last September, after the Sikkim earthquake, the 8 states of the north east region (a high seismic, volatile zone where floods are an annual feature and where the central government is building multiple mega dams such as Tipaimukh and Lower Subansiri, thus endangering the region even further) met to review their disaster management mechanisms. During the meeting, every state said that despite having a policy in place, it wasn't in a position to actually fight a disaster, because it neither had skilled manpower, nor the technical capability (the crucial components for building a 'response force'). The states then asked the central government to set up a NDRF station in each of the state capital and provide with adequate number of personnel. Now, when such is the case, NDMA must go beyond sending directives to form disaster policies and leaving the states to manage 'their own disasters'. Instead it should assess the actual preparedness of each state, based on its risk potential, to check a disaster. Also,it should assess the kind of monetary and technical assistance each state needs to set a disaster response force. Unless this is done, things are not going to move far beyond the rhetoric and disaster management will stay as another of those thorny national vs state subjects. Of course, being the dramatics-loving Indians that we are, some things will still remain unchanged: after the disaster strikes, we will push each other, cry and talk loudly and refuse to be in a single file while waiting to be rescued. But if we have at least a team that's been raised, trained and equipped for fast and effective post-disaster management, we will not feel as helpless as we do now.